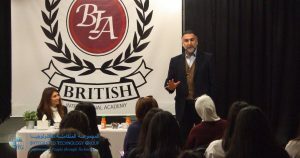 Mr. Walid Tahabsem our President & CEO, participated in The British International Academy (BIA) Career Day as a guest speaker to speak directly to the students sharing his vast experience in business and entrepreneurship. In this event, Mr. Tahabsem shared his personal experience on how he grow a fruitful and successful business in a sector that was not the one he chose for himself many years ago, but rather than rejecting his new environment he adjusted to the changes and sized the chances given to him to create innovative solutions that are now empowering people worldwide. Mr. Tahabsem also presented the students with guidance and advice to consider for their vision to the future, their upcoming choices on educational majors, the skills needed for success, how to handle any obstacles, and how to stay focused.